It was 1 o'clock in the morning and I was 500 ft over Normandy waiting to jump from a Stirling bomber. 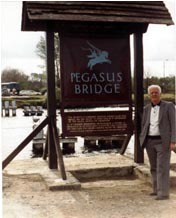 I was one of the vast numbers of airborne forces involved in Operation Overlord. During WW2 all members of the Parachute Regiment were volunteers and recruited from the many regiments throughout the Army, I was with the 7th Bn Cameron highlanders. We had a visit from General "Boy" Browning who gave us a talk on the role of the Parachute Regiment and asked for volunteers to form the 5th Bn (Scottish) Parachute Regiment. About 400 volunteered and we were posted for training to Hardwick Hall near Chesterfield which was the Training School for the Parachute Regiment. The big attraction in volunteering was the 2/- (10p) a day extra pay which doubled our pay as we were only on 2/- a day. The training was very tough and quite a number of volunteers were returned to their former units as unsuitable. Those who survived the initial training were then committed to very intensive training to ensure full fitness. A training day started at 8a.m. and ended at 6.30p.m. every day. The training staff bawled and shouted at us all day long and after a few days we were doing things instinctively despite the shouts of "go go go". Practice of despatching from aircraft was carried out on dummy fuselages of aircraft with floor exit and door exit aircraft, these being mounted about 12ft from the ground. For the next stage of our training we moved to Ringway Airport in Manchester where RAF instructors took us in hand to help us land properly. The normal physical training continued at Ringway to keep us up to peak fitness. Descents from aircraft was the next stage in our training and to qualify as a parachutist you had to do seven descents, two from a static balloon and five from aircraft. Tatton Park in Manchester was the Drop Zone and this was where the balloons were located. Slung from the balloon was a basket roughly eight feet square with a hole in the base, big enough for a body and parachute to pass through, with a bar above the aperture to hook the static line to. The static line was the means of releasing the parachute from the containing bag to allow it to develop. Four men at a time with an instructor(RAF) went up to a height of 800ft. My turn with three others eventually came round and it was then that I began to doubt the wisdom of volunteering for this branch of the services. It was quite an eerie feeling when we stood, one in each corner of the basket watching the ground get further and further away and the silence only broken by the whistle of the wind and the instructors voice "800ft lads, get ready No 1" - no time was wasted in despatching us. You sat at the edge of the hole in turn and the instructor did the hook-up to the bar then "Action Station" - hands on edge of aperture, sitting with legs in hole - head back - and "GO". The sensation of falling was terrifying, the drop being about 180ft before the 'chute developed', you were then talked down by an instructor on the ground with a loud hailer. It was a tremendous feeling of exhilaration when you were back on the ground and you couldn't wait to do a repeat performance. The next stage was dropping from aircraft which were Whitley bombers, stripped to carry a stick of ten men. There wasn't a lot of space in this plane, the round aperture in the floor about halfway up the fuselage. Five men sat each side of the aperture alternately facing each other and there was little or no headroom, extremely uncomfortable to say the least. When the red light above the aperture came on, No1 swung his legs into the aperture and awaited the green light which came on in a matter of seconds and off he went followed by No 2 who was on the other side of the aperture and the remainder followed in turn. After completion of the required number of descents there was a ceremony of presenting the coveted wings and you became a qualified parachutist, but once you had completed the course and qualified, refusal to continue was a Court Martial offence and imprisonment of normally 56 days. Our home base was at Larkhill in Salisbury Plains where we completed our training being dropped from aircraft, at night and in daytime. The aircraft being used were Whitleys, Albemarles, Dakotas and Stirlings. The 5th Bn (Scottish) were scheduled around March 1943 for North Africa and I had a bout of pleurisy and was sent to hospital.When I came out, the 5th were gone and I was posted to the Depot at Chesterfield to join a draft for North Africa to rejoin my battalion. A few days before embarkation, however,I and a number of others, mostly signallers and mortar men, were taken off the draft and posted back to Larkhill to join a new battalion which was being formed, the 12th Bn (Yorks) Parachute Regiment. Again the endless exercises continued as before in preparation for the invasion of Europe and then in May 1944 we took off for a transit camp near Keevil and this time we knew it was for real. The camp was ringed with armed soldiers (not Airborne) and no one was allowed in or out. The first morning my company was marched to a hut and seated for a first briefing. There was a large map mounted at the end of the hut and was covered with a cloth. The briefing offer, after a few words of introduction removed the cloth and revealed a map of the Normandy region of France showing the German troop positions in the area. In another hut there was a sand model (large) of the area showing the Drop Zone, Rendezvous point and objective. The 12th Bn objective was the village of Le Bas De Ranville. 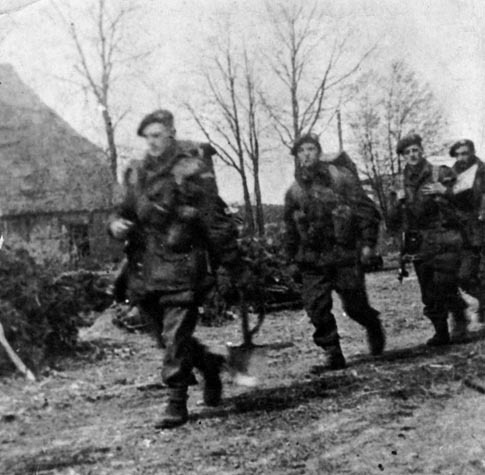 The 6th Division objective was to secure the bridges of the River Orne and Orne Canal, the river and canal running close to each other, and secure the ground east of the river and take out the gun battery at Merville which could cover the beaches where the sea landing would take place so we were scheduled to go in a few hours before the sea landing. Briefing took place every morning and any changes in enemy troop movements were noted. We were informed that "Operation Overlord" would take place on 5th June but adverse weather conditions cancelled this and on the evening of the 5th it was confirmed that we would go. The parachute soldier at this stage of the war carried a fairly hefty load on his person, and all had a special kit bag strapped to the leg with a 20ft length of rope attached to it and tied to a waistbelt. This you released during descent and it was quite handy in letting one know in the dark when you were about to hit the ground, in my case I carried a wireless set which was wrapped in foam rubber. We arrived at the airfield near Keevil around 10p.m. on the 5th June and made our way to the emplaining area after drawing chutes. My battalion was being transported by Stirling bombers with Canadian crews. Exit from the Stirling bomber was through a rectangular floor aperture at the tail end of the aircraft. Very few of the men had experienced action before and we were all in good spirits - the great adventure was about to begin - the signal corporal who was in the next plane to mine came over and shook my hand saying "I'll see you over there Jock" and I never saw him again, he disappeared after being dropped in the wrong area with a number of others who managed to rejoin us, all except him and the Signals Officer. It would be around 11p.m. when we taxied to the runway for take-off and we were on our way. I must say that no one felt like talking after take-off and the noise of the engines made it almost impossible anyway. We were scheduled to be dropped around 01a.m., our Drop Zone being a few miles inland. At last we got the order to "Hook-up" and "Stand To". I was No 2 to go. you had to rely on the guy behind you handing you the end of your static line, making sure it was free of entanglement prior to hook-up. all eyes were then glued to the lights above the aperture. There was some light anti-aircraft fire as we crossed the French coast. Then "Red On" bawled the despatcher (RAF) followed by "Green On" " GO GO GO" and through the aperture we went as fast as possible. We were going in about 500ft and it was essential to have a fast despatch to ensure that we would be closer together on the ground. It was a moonlit night with some light cloud. I had quite a good descent, landing a bit heavily but safely in a corn field with stalks up to my waist. The danger at this point was probably being shot by one of your mates so a simple code system had been devised, the first day being "Ham" to be answered by "Egg" - the next day "Bread" and "Butter". I gathered myself together after releasing my harness and dumping the jump jacket. The jump jacket was put on over your outer equipment so that your lines on despatch couldn't snag on anything. I then had to get to the Rendezvous Point which was a quarry just on the approaches to Ranville. As I proceeded I heard movement just ahead of me and I went to ground and gave the code sign "Ham" and got the "Egg". It happened to be a signaller of my own platoon and he had injured his back in the drop. We got to a hedgerow at the side of the field and he couldn't go any further so I had to leave him there and carry on. We had been told at the briefing not to stop to help wounded or injured men under any circumstances - the objective was top priority and would require the maximum number of men to achieve this. I eventually reached the quarry being guided by a flashing red-light for my battalion, the others being a hunting horn and a whistle, they having different rendezvous points. The Drop Zone was coming under fire by this time but most of us were clear of it by that time. I was C.O. 's signaller and reported to him on arrival. By around 3a.m. and only about half-strength the C.O. decided to move on to secure Le bas De Ranville and resistance was fairly light, the Germans having withdrawn to a wood to the South and by 4a.m. we were well dug in. Many of my battalion were dropped in the wrong area and in some cases it was a few days before they got to us. Things were remarkably quiet for a short time and then around 4a.m. we heard the naval barrage starting and knew that the seaborne landings were about to take place. Come daylight, however, our forward position reported enemy troop movement in our direction supported by two S.P. guns. With this forward position were a naval officer and a rating who had parachuted in with us and had established a radio link with a cruiser off the coast and unfortunately they were killed in the first assault on the forward position as was a mate of mine on radio contact with H.Q. The forward position consisting of an officer and twelve men came under heavy fire and suffered casualties, but the officer and three men managed to escape and pulled back to the company position. The two S.P. guns were destroyed by 6 pounder guns of one of the other companies. Another section reoccupied the forward position along a hedgerow. later that day another attack was launched on our position and we came under heavy mortaring and S.P. gunfire and our casualties were fairly heavy. That evening we witnessed the remarkable sight of around 500 tug-aircraft and gliders streaming in over the coast to land astride the Orne River and Canal. It looked like we were well and truly there to stay. The commandos by this time of course had arrived at our position, after coming ashore at Sword beach and suffering heavy casualties. Our division had secured all objectives and were holding firm despite being under almost continuous heavy fire and this of course meant casualties. We were pinned down in a small bridgehead and awaiting the fall of Caen before the breakout could take place. My battalion was well under strength and we were moved back and forward along the line exchanging position with other units. On D+6 my battalion (what was left of it) were chosen to take the village of Breville, which was heavily defended. We were down to around 8 officers and 350 men by this time and we proceeded to a place called Amfreville where we trooped in to the local church for briefing and the order was "Breville must be taken". The Black Watch had tried to take it and suffered heavily in the attempt. The Commandos were holding position on the outskirts of Amfreville facing towards Breville and we took up position for the attack on the road alongside the Commando position. The attack would be proceeded by a barrage around 9.45 and the attack to be launched around 10p.m. supported by a few tanks. Unfortunately the first salvo fell short and landed on the road we were in and our C.O. and several of H.Q. personnel were killed and others wounded. The Germans then laid down a counter barrage just as the attack company moved off and they were cut to pieces in the open ground approaching Breville. I went in with the second company and had to pass through the dead end wounded of the attack company . The Company Commander, although lying wounded, waved us on to keep going. I reached the edge of the village with a number of others and got pinned down in a ditch. After taking our bearings we moved out to reach the Breville crossroads exchanging fire as we went. I still had the wireless set on my back but had lost the aerial and things were a bit uncertain to say least, the village was virtually on fire from end to end. At the crossroads we came under a very heavy bombardment and again had to shelter in a ditch for what seemed like hours till eventually except for some spasmodic small arms fire, we had secured our positions. We lay all night expecting the usual counter-attack but at dawn patrols sent out reported that no enemy was contacted, Breville had been taken at last and our bridgehead was complete. 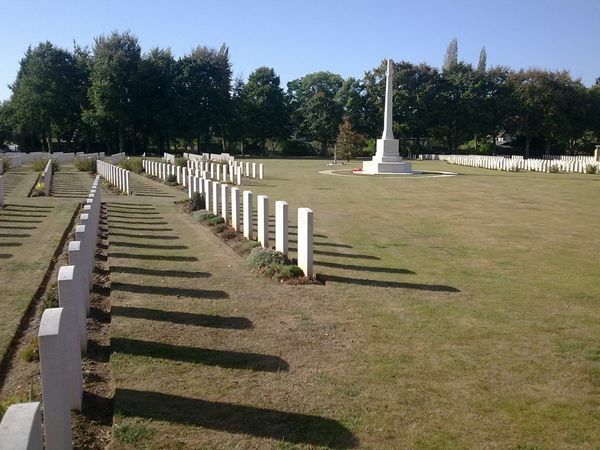 The cost was very heavy indeed, all our officers killed or wounded and 168 dead from all companies, only around 100 of the original battalion left and the following day was spent burying the dead, British and German. I assisted in burying one guy who had been killed alongside the burning church and he was buried where he had fallen. When I returned to Normandy at the 40th anniversary, I went to Breville and the grave is still there alongside the ruins of the Church. Apparently the people of Breville asked that it remain there instead of being removed to the Military Cemetery at Ranville. I could write a few pages on the battle for Breville but I've given you brief highlights of my own experience. Breville later became a Battle Honour for the Division, such was its importance for the Normandy campaign. Campbell sadly passed away in March 2009, followed shortly afterwards by his wife, Mabel, in May 2009. 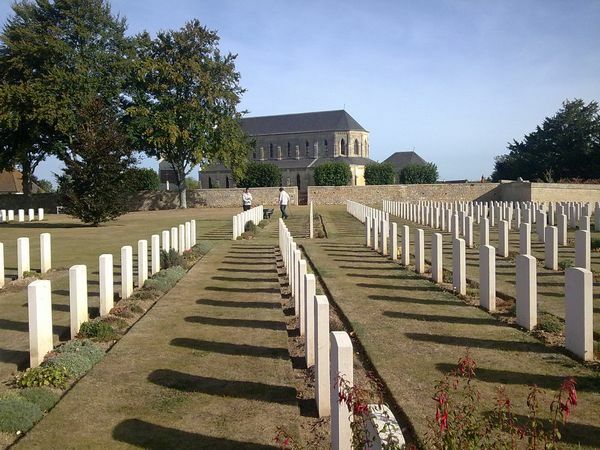 The Commonwealth War Graves Commission kindly granted permission to have his ashes buried in the war cemetery in Ranville, Normandy, France. He will now lie with his fallen comrades. Campbell's ashes were buried on the 11th September 2009 in an unmarked plot at the end of the rear row. Campbell kept some momentoes of his time in France and Germany, among them these three fighting knives. 1. A US Airbourne M3 knife in a M8 scabbard. 2. A Hitler Youth dagger. 3. The Fairbairn Sykes Commando knife.